OCENS is continually adding new sources of data to its WeatherNet library. No where are we more aggressive at this than latest and greatest GRIB sources from some of the best weather models (and minds) in the world (RAP and HRRR as well as Great Lakes wind and wave). The latest set of additions also represent the transition of classical data (and I mean really classical data like weather charts!) 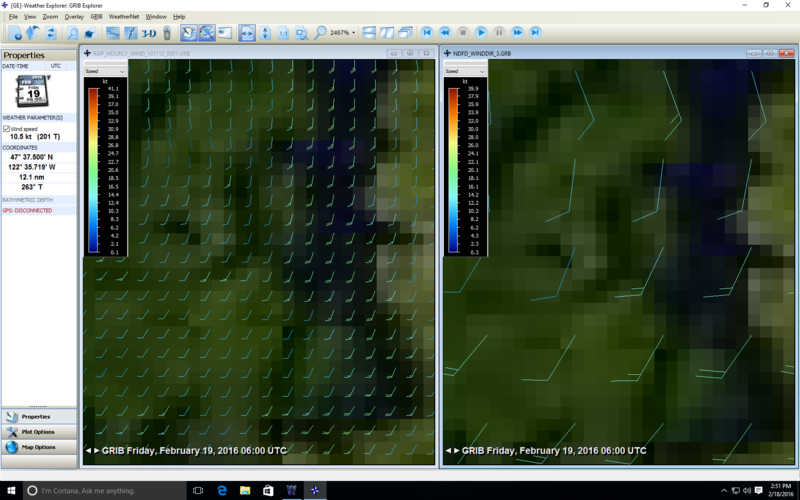 into a GRIB product (NDFD) and the transformation of observed (not modeled) wind information into GRIB (ASCAT). Detailed information on the various GRIB sources that are available and what the differentiating factors between them are. The Rapid Refresh (RAP) model is available in three forms. The RAP HiRes (also called RAP CONUS) model is focused on the continental US. Nevertheless, it provides marine coverage out to about 130 degrees W on the US West Coast and about 60 degrees West along the US East Coast. Much of the Caribbean is also covered as is all of the Gulf of Mexico and Gulf of California. It offers about 8 data points for each degree of coverage. The second RAP model is the RAP Fast (also call RAP NAM) . This RAP Fast model covers all of North America, including Alaska, Hawaii, and Central America. A chunk of northern South America is also included in this model. This is a lower spatial resolution model than the RAP HiRes providing 3 data points per degree (compared to 8 data points per degree in the HiRes). For the satellite user, this is important because for the same area, a RAP Fast file will download faster than a RAP HiRes because it contains fewer data points. Both RAP models offer 1 hour temporal resolution model forecasting over an 18 hour time period. Each was constructed to serve the needs of users needing frequently updated short-term forecasts. This means it is most commonly used by aviators and severe weather forecasters. However, these features will benefit any GE Plus user monitoring short-term weather conditions changing at a pace that is faster than the 3 or 6 hour model update frequencies typical of most weather models. The third RAP variant is the Very High Resolution Rapid Refresh (HRRR) model (it is pronounced herrr). This is awesome data with a spatial resolution of about 3 km or more than 30 data points per degree. Data is of such a high resolution that it can be used in inland waters such as Chesapeake Bay, Long Island Sound, Puget Sound, San Francisco Bay and others. In Puget Sound, for example, the HRRR model returns 3 to 4 wind barbs where other models display 1 at most. Of course, the trade off for this high spatial resolution is BIG file size. So when using HRRR data, be sure your GRIB boxes are 1 or 2 degrees at most if connecting through a satellite phone. Expand if on cellular or network connections. Wind, precipitation, CAPE, lifted index, air temperature, 500 mb and cloud cover GRIBs are available in all models. Pressure data is also available in the HRRR data set. Where to find in WeatherNet: RAP and HRRR wind, precipitation, CAPE, lifted index, air temperature, 500 mb and cloud cover GRIBs are available from WeatherNet’s Portal Mode (GRIB Wind/1 day) or Library mode inside the GRIB Met folder. Data cover North America and the Caribbean, large chunks of the West Atlantic and a significant portion of northwest South America. These wind data are unlike any other GRIB wind information in the world. The ASCAT satellite is continuously circling the earth and scanning the ocean surface. Collected data is processed using sophisticated algorithms and converted into measurements of wind speed and direction. Values are converted into GRIB form and pulled by OCENS to its Everon WeatherNet servers. What’s unique about ASCAT wind GRIBS? These are not modeled winds such as is the wind data in models such as the GFS, WW3, Navgem or really any other wind grib. Instead, these are the actual winds, measured by the satellite, and passed back to earth for distribution to ocean users. We’re not guessing at the winds here. We are actually measuring them…as if we hand a wind vane or buoy sitting everywhere in the ocean. Where to find in WeatherNet: ASCAT wind data are available in Portal mode (GRIB wind/1 day) and Library mode under the GRIB Wind/Wave folder. Coverage is global. 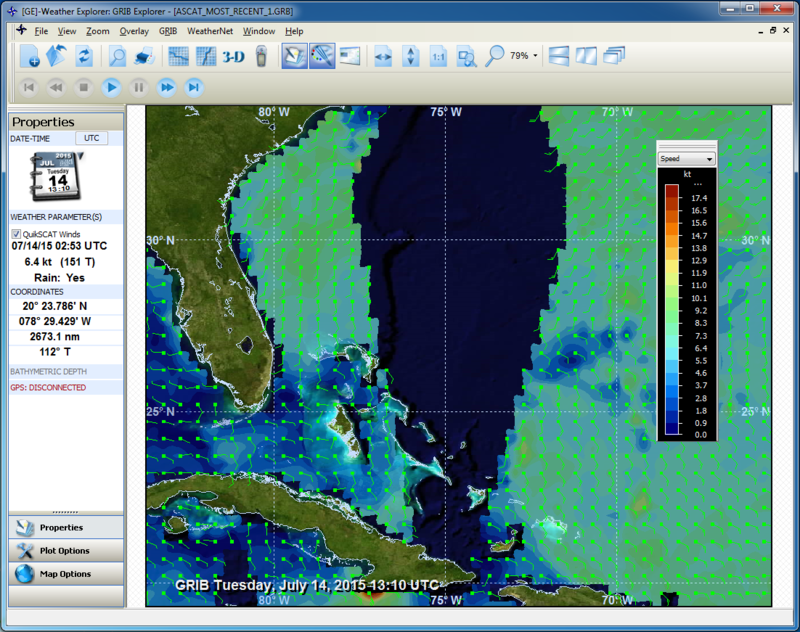 *GRIB Explorer for windows is required for viewing ASCAT data. 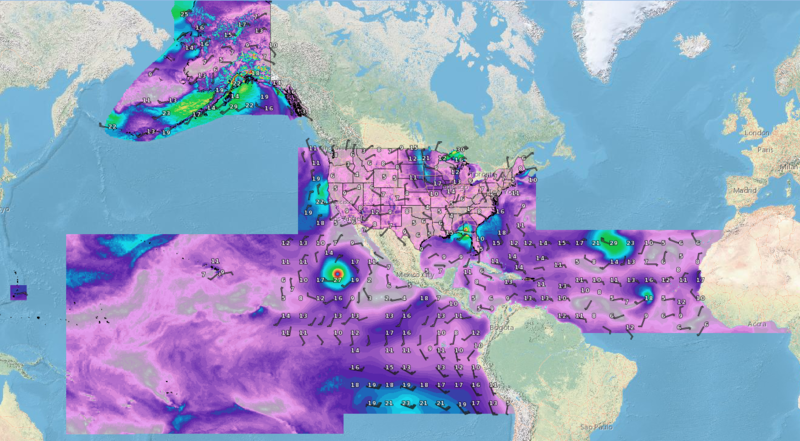 The weather forecasts embodied in the weather charts produced by forecasters at the Ocean Prediction Center and the National Hurricane Center represent some of the highest quality and most reliable products on the planet. Their limitations? They are static weather charts. Picture files. Jpegs, tifs and gifs which you download and look at but which don’t offer much in terms of interactivity. WeatherNet’s NEW NDFD wind and wave GRIBs change all of this. They represent the result of converting those weather charts into GRIBs. Consequently, they preserve all the human intelligence and local knowledge put into those charts but make this information available in the form of GRIBs which can be animated, layered and closely analyzed. Where to find in WeatherNet: NDFD data are available in Portal mode (GRIB Wind/1 thru 6 days) and from Library mode inside the GRIB Wind/Wave folder. Coverage includes all US and Alaskan waters plus the Caribbean, Eastern Pacific and the Atlantic hurricane corridor. The newly added Great Lakes wind and wave (GLWW) data is available in two flavors. The very high resolution data is available at a scale of 1/16 of a degree or approximately one data point every 3.75 miles. The coarser resolution, roughly 8 mile scale data, is labeled FAST in WeatherNet because its downloads occur much more quickly than the fine resolution product. FAST file sizes are roughly just 10% of the size of the high resolution product. Where to find in WeatherNet: GLWW GRIBs are found in Portal mode (GRIB Wind/Days 1 through 7) and Library mode. To find GLWW in Portal mode, be sure to check the Great Lakes boxes on the GRIB Model Preferences wizard page. GLWW is found inside the GRIB Wind/Wave folder in Library mode. All data are added to your computer-side WeatherNet databases with small incremental updates at the end of your WeatherNet session. A reinstall of WeatherNet or a File List Update does NOT need to be conducted to have access to the new data sets.